No. You don’t want your uncle Jimmy to get ordained online to do your wedding. It is an honor to be asked, and good on you for wanting to make it as right as possible. Unfortunately, what you are asking just isn’t. Would you ask a teacher help you get a “less weird” online teaching certificate? Or a doctor to help you get a “less weird” online medical license? Getting ordained through Billy Bob’s Online Church of the Twenty-Buck Blessing may seem like a good idea, but it overlooks the training and experience needed to do a wedding well. A teacher does more than pull off classroom management as a one-time substitute, and a doctor more than demonstrate mastery of the tongue depressor in a routine visit. In the same way, a pastor does much more than simply read a wedding service. Your friend will be putting someone who has never done a wedding in charge of the single most expensive and important party of their life. Will they also be asking a friend who takes nice Instagram pics to be photographer? A minister is air-traffic control. They make all of the many parts and people move in coordination. Brides are under a lot of stress. They do not need a rookie at the helm. Usually my friends then respond with: That’s a lot to think about, but my niece/friend/neighbor is really important to me. I’m the only Christian they know and being connected to a church isn’t a priority for them. I think this is a great opportunity for me to ask some good, tough questions to her and her fiancé. Don’t you? I love your heart. You don’t want an online ordination. On top of that, encourage them to try a church. You and I have both experienced the support and perspective that faith and a multi-generational church community has been in keeping the wheels from coming off our marriages when they might have otherwise. I have been at this a long time. I actually do know what is going on. 99 couples out of 100 come to clergy and ask for a “great wedding.” The fact that you think you are their best option for that, friend, reveals their need for an actual pastor. It feels good to be asked, and it feels good to give someone what they want. But that doesn’t really help them. Pastors do not to acquiesce to people’s whims and wants, but move naive couples off of the dime of “great wedding” to “great marriage.” The first is a one-off. The second is a lifetime. I am not saying, “Let a friend down.” I am saying be a great friend: Give them a third party – one who can say things important for their life together, but hard for them to hear. Then you and your wife are free to take the role of wise old married friend confirming the ancient wisdom offered by that pastor. Many have been burned by the church and ministers, or, not knowing or distrusting the church, have failed to engage. But, to bring this full circle, bad ministers and bad churches do not invalidate the help provided by good ones any more than being harmed by bad public school teachers or bad doctors invalidates teaching or medicine. Don’t fall into the trap of reinforcing the perception of irrelevance of some of the most potentially helpful relationships in their marriage: a church and qualified, called, experienced clergy. Make their circle larger: Include a real church and a real pastor. Ordination is not a piece of paper. Ordination is a long process that begins when the community sees someone’s calling. A person confirms that call through a period of prayer and community discernment. Then the person endure rigorous preparation that typically culminates in a 3-year Masters of Divinity degree program. After seeing the faithfulness of the person in their faith journey, service, and spiritual preparation, then the church ordains them, setting them apart and asking God to make them, by His grace, up to the task of leading God’s people. In ordination, the community of faith, below, around, and above invests in a person’s training, and then asks them to, as Eugene Peterson said, “Lash themselves to the mast of Word and Sacrament” on that communities’ behalf. Ordained people pledge to be the one whom, when the storms of life come, the community can count on. They pledge to be there when we are married, when our children are born, when they own their faith, and when we are ill and when we go and meet our maker…and every week in between. It is a sacred covenant between God, the ordained, and a community. Because of our relationship with our clergy: we have an awareness of the sacrifices they have made, and knowing that they literally risk their supper if they offend us, we trust that the occasional hard things they say and we don’t want to hear deserve a listen. Googling an ordination makes a mockery of that process, real pastors, and the communities that call them. And it doesn’t help the people getting married. Buying an ordination does two things well: It gives pastors lots of complements from people whose last wedding was officiated at by a bogusly ordained friend, and it feeds a side of the one buying it that really doesn’t need feeding. Have you noticed the creeping narcissism in the evangelical church? Perhaps you have noticed it in the architecture as churches have been remade into the image of the places the world gathers: Foyers into coffeehouses, sanctuaries into concert halls, altars into comedy club stages. 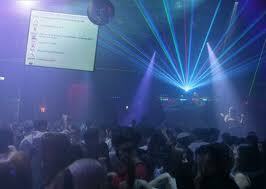 Candles and incense replaced with light shows and fog machines borrowed from the nightclub scene. …and that actually is a nightclub. Surely you couldn’t help but notice it in Victoria Osteen’s recent exhortation, “You don’t worship for God. You worship for yourself.” Oh, she was criticized her for it, but is this not a message we too are subtly sending? Perhaps Ms. Osteen is just more honest about it? Regrettably, this is a wholesale corruption of what the Reformers actually taught. Calvin, Luther, and Cranmer each have notebooks filled with quotations from the early church fathers. Chris Armstrong, editor of Christian History Magazine, writes, “The Reformation is an argument not just about the Bible but about the early Christian fathers, whom the Protestants wanted to claim…you look and you see it everywhere. The Reformers use the Fathers all over the place…Calvin read Augustine…Luther read Jerome. The index of Calvin’s Institutes is filled with an enormous number of quotations from the Fathers. And in the first preface to that work Calvin did his best to show his teachings were in complete harmony with the Fathers. The Protestants…were keen to have ancestors. They knew that innovation was another word for heresy. ‘Ours is the ancient tradition,’ they said. ‘The innovations were introduced in the Middle Ages!’ They issued anthologies of the Fathers to show the Fathers had taught what the Reformers were teaching.” You see, the magisterium, the gathered wisdom of bishops interpreting the scriptures under the lineage of the tradition was not their problem. In fact, they went to great lengths to prove specifically that their teaching was the Fathers! But alas, we have jettisoned the Reformers’ actual belief in the wisdom of the church’s teachers, whose interpretation was expected to stand in the tradition of the early Fathers. The mess of pottage we have traded it for is a disembodied sound bit. Disengaged from the Reformers reliance on the Fathers, we have what can be cynically referred to as “solo scriptura” – my private interpretation. And when “solo scriptura” is combined with American individualism and allowed to simmer with post-modern “truthiness,” we get a toxic soup of the dystopic self. We then feed this soup to a generation reared as the centers of the universe, then wonder that they are consumed with self. How could they not be? …when “solo scriptura” is combined with American individualism and allowed to simmer with post-modern “truthiness,” we get a toxic soup of the dystopic self. We then feed this soup to a generation reared as the centers of the universe, then wonder that they are consumed with self. How could they not be? The church has consumed “me” like a diet of high-fructose corn syrup. It tasted so good going down, that we did not notice that we grew both addicted to the taste and unable to roll over in our spiritual flabbiness. Worse, the poison has so clogged our synapses that we are unable even to remember what rigorous, healthy spiritual activity was once like. I am no longer stunned. I have watched how anything that smacks of commitment is sold on its potential to “bless.” This has now extended to our giving. Perry Noble’s church is offering a 90-day money back guarantee on tithing. Seriously! Giving in order to get. It seems that every week contemporary mega-evangelicalism offers a new narcissistic low-water mark. And just like that, the commodification and monetization of the church is complete. Where did we think “nothing but you and a Bible” was going to end? Where did we think that reshaping the church after our cultural preferences would lead? Have you noticed the creeping narcissism? Do you have examples of your own? Do you see a way out? Next Week: Part 2- Conciliarity: The Early Church’s balance between “rule by the man” (A secular idea adopted by Rome) and “rule by the book” (an Islamic idea adopted by Protestants). To be fair, mainliners have had this for years, but it plays out in different ways.